Anyone who knows me, knows that I enjoy a walk. I did it a lot in Lanzarote as part of a walking group and with good friends… up and down volcanoes, down to hidden beaches, along promenades and across lava trails, and now I do it here in Almeria. Warning – shameless sales pitch! 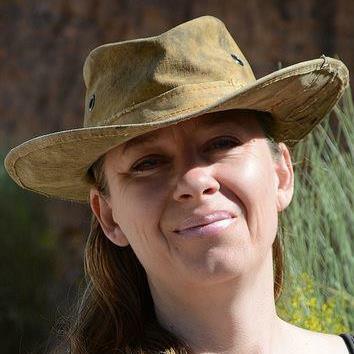 After moving to Almería in 2012, I joined a group of loons – the Indalo Hash House Harriers. Some of the Hashers run, some of us walk, but we all like a laugh and enjoy good food and perhaps a drink after our hikes. But… walking in the hot Spanish sun without sun protection isn’t good for those of us whose noses turn into Rudolph’s at the slightest peek of sunshine. I’d been looking for a new sun hat for while, something I could wear while out hiking. I’m not a baseball cap kind of a gal, but you’re also unlikely to see me in a straw bonnet with flowers on it. Needless to say, I’ve been hunting for some time – trying on all manner of styles but nothing worked for me. I’m just too damn fussy! I’ve been after a small rucksack for about five years – same story – I simply can’t make a decision. I should have picked up the small leather one I liked in Granada but Mrs Indecisive in me simply wouldn’t make a decision. I like cowboy hats… and knew that was the kind of thing I’d wear. But the options here are limited. I could have had a pink one with sequins around the rim, or a black felt one with a Sheriff’s badge on the side. Neither are really me. But then an email landed on my computer. It was from a company called Tarphat. They were looking for people to try out and provide an honest review of one of their products. Well, as soon as I saw the hats (and more importantly the cowboy hats) and then heard the story behind them – I had to get involved. 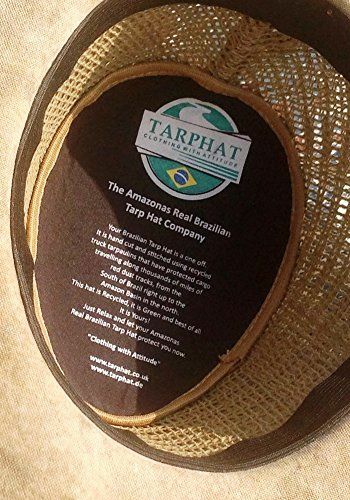 A lovely couple called Charlie and Ana run The Brazilian Tarp Hat Company making these unique walking/trekking/hiking hats which come from a village on the edge of the Brazilian Amazonian Rainforest. Ana is the connection to Brazil, because she was born there – in the Rainforest. The hats are made from recycled truck tarpaulins which are handcrafted into the hats you will see on their website. Each hat tells a story evident in its characteristic looks and is backed up by a printed history inside the crown; some have patches or Portuguese writing on them giving a clue to the past life of the fabric. This, combined with an in-built durability, give them an ‘attitude’ that makes them really stand out from other hats. We are all individual so why not reflect that in our clothing? This video clip is of Pedras Negras and where Ana was born. Charlie and Ana were blessed in the church you can see there. This is typical of a village in the area. Most tend to be situated on the river because there are no roads to most of the villages. Most of the residents drink the river water, although some adding tablets to make it safer. This has presented a real need for fresh, safe drinking water. Pedras Negras is first on the list. So – I had a chat to Charlie and Ana, sent them my head measurement, and my new hat was promptly despatched. It came here to Spain without any problems, and arrived in just a few days. Well… I eagerly opened up the box knowing I’d love it – but I was unprepared for Alan’s reaction. No sooner was the box opened and it was ripped from my hand and promptly stuck on his head. Luckily my head is smaller than his, so he can’t steal it – but he loved the hat too! Aside from the shape, a classic cowboy style, it is manufactured from the tarpaulin covers from trucks that supplied the villages. Every hat is re-waterproofed and I swear mine will probably outlive me because it is so hard wearing. The hats come in a number of styles and designs, which means there is something for everyone’s tastes. The brim has a wire rim so you can style the brim into whatever shape best suits you. It’s recycled… it’s ‘green’.. it’s stylish… it’s hardwearing… … … oh yeah and every hat is unique too! They also now do a range of accessories too, including wallets and (happy days) tarp bags too. Looks like I may get that rucksack after all – after Alan gets his new Tarphat of course! If you would like to buy one for yourself – Spain Buddy readers can enjoy a 10 per cent discount too. Just quote WATERHAT when purchasing. This review was provided as a private arrangement between me, Ana and Charlie. I was offered a small payment to do the review but I asked that the payment be donated to a charity of their choice instead. They chose the Nepal Disaster Fund. It was probably the easiest, most positive review of a product I’ve ever had to write.